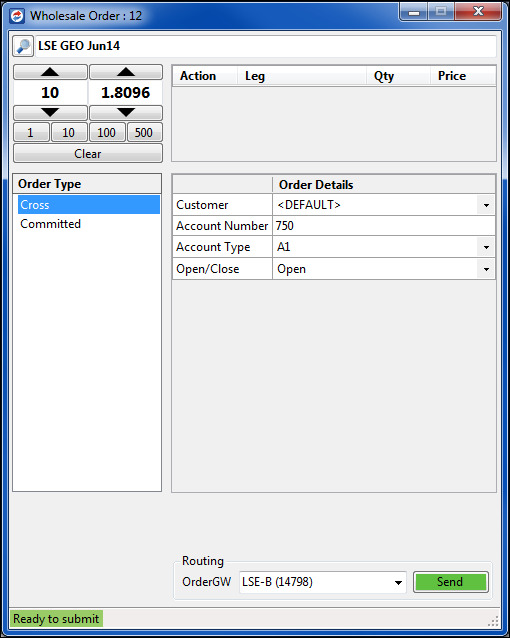 You can use the Wholesale Order window to make cross trades and committed trades on LSE when connected to LSE Gateway 7.17.45 or higher. Note: Cross trades on LSE are considered OTC trades. Prices generated by the cross trades are not included in the central order book, and fills do not update LTP in the book. 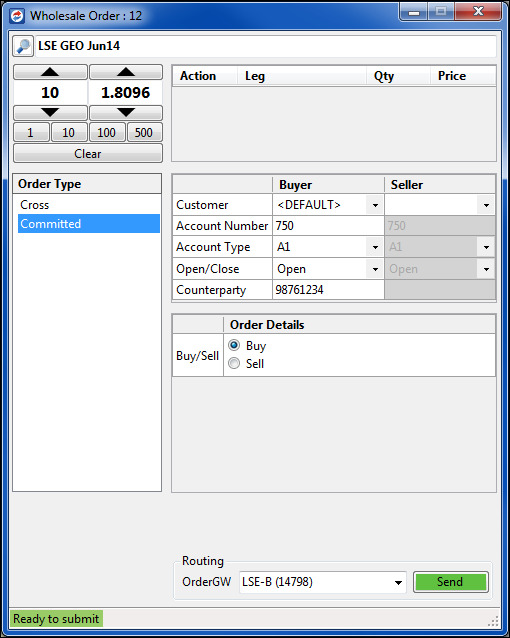 In the Wholesale Order window, the following additional fields are used for submitting an LSE cross trade. Only customers selected in the X_TRADER Customer Defaults window appear in the Customer field list. Required for LSE cross orders. Enter a user-defined account number of up to 12 characters. Sets the account type used for the trade. This is a required field. A committed trade occurs when two exchange-approved parties pre-arrange a transaction and their committed orders are matched at an equal price and quantity on opposite sides of the trade. Exchange rules state that each side of a committed trade must contain a required minimum quantity and is priced inside the bid and ask posted at the time the order is submitted. Note: LSE will reject any committed orders that do not meet these requirements. Both sides of the trade must have the same price and quantity. A committed order must contain the exchange-defined counterparty code. Select Committed in the Order Types pane. Enter the exchange-defined counterparty code. Required for LSE committed orders.